Kaspersky was one of the first security companies to offer the end user a cross platform AV protection suite, some years ago now. Since then the company has improved its products hugely and now produces one of the leading security suites available. There are a lot of features to like about Kaspersky Total Security 2018, all of which help you not only be protected from whatever’s out there but also help you manage your system better. Kaspersky’s Total Security 2018 is the mega product of the company’s AV and protection utilities for home users. Obviously prices can change depending on what deals are currently available, so check the Kaspersky website for the latest guide. Much like the Bitdefender entry, Kaspersky has gone to great lengths to provide an easy to use and simple to understand interface Whilst, again like Bitdefender, you’re able to delve deeper into the inner workings, the average user isn’t instantly bewildered by page upon page of technical jargon, icons and sub-menus. 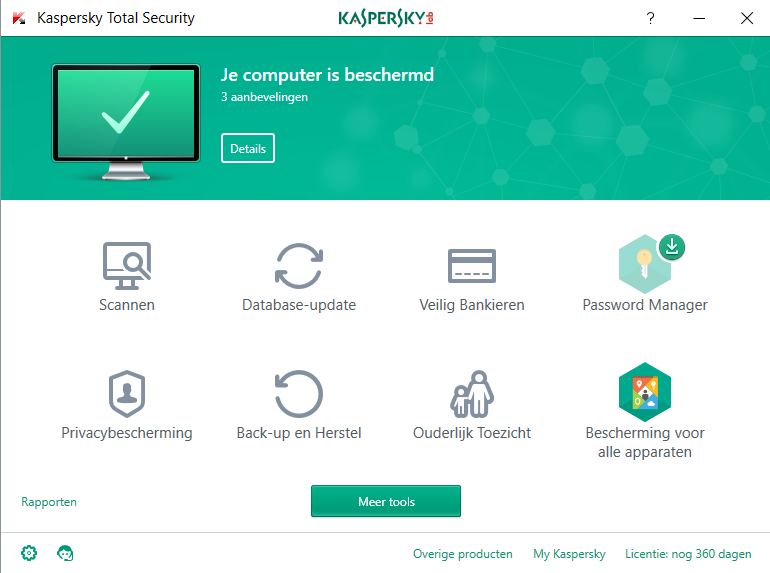 It’s handy too that everything starts from the Kaspersky online portal, where you can download your purchased software, alongside installers for other modules, that eventually all fall under the same control centre umbrella. The front end categories that are available via the control centre are: Scan, Database Update, Sale Money, Password Manager, Privacy Protection, Backup and Restore, Protection for all devices end Parental Control. Most speak for themselves and are fairly self-explanatory; however, components such as Safe Money and Privacy Protection deserve a little more explaining. Safe Money utilises Kaspersky’s unique protection engine, whereby your online transactions are safely behind the product’s security web. This feature takes care of protectingyour shopping as well as online banking, so it’s an impressive weapon in the already ample Kaspersky arsenal. Privacy covers a range of different features. This component protects you when surfing, guarding your online identity and information, whilst also actively blocking malicious websites and preventing any form of tracking or monitoring. It also includes an element that blocks any attempts to access your computer’s webcam, which is certainly a handy feature; it will also prevent any attempts to access your stored data whilst you browse the Internet. Needless to say, the features available are certainly impressive. Beyond the few we’ve mentioned above, there are also controls to improve browser security, protection for any cloud access, a vulnerability scanner and a trusted application mode that will only allow whitelisted programs to be executed. You can create a Kaspersky Rescue Disk, which you can boot from should something ever go wrong allowing you to scan and clean your computer without it needing to access Windows. The list goes on and covers just about everything you would want from an all-encompassing security suite. In terms of speed of operation, and the performance hit on the system, Kaspersky Total Security 2018 is about on par with that of Bitdefender. Admittedly, it’s not as fast at completing a full system scan as Bitdefender s but it’s only a minute or so out. The performance hit on the system is negligible, in fact you’ll be hard-pressed to notice any negative impact once the software is installed and continually scanning. One last component worth mentioning is the Parental Control feature. With this Kaspersky offers a method of keeping children safe whilst they use their devices. You can create usage scheduling, GPS safe zones and receive notifications should anything suspicious attempt to access your child’s device when they’re using it Beyond that there are also filters to stop children accessing adult sites, or sites that can feature disturbing content. Kaspersky Total Security 2018 is one of the leading AV and security products for the home user.